The new sensory bike is an adaptation of the most recent sonic bike. Sensors fitted to multiple areas of the bike manipulate the sound playing, enabling the rider to control what they hear by how they ride. The sensory bike becomes a perfromative instrument – with riders choosing to go slow, go fast, to hop, zig zig, circle creating their own unique sound piece that speeds, reverses and changes pitch, while dancing on their bicycle. Sprocket sensor: currently measuring a pulse – capturing the motion of pedalling, forwards or backwards, fast or slow, used to control speed & direction of the track. 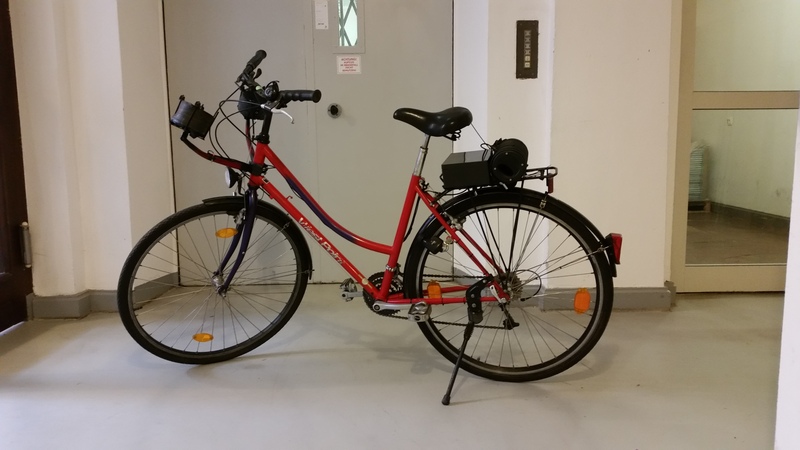 Dynamo sensor: measuring bike speed – currently controlling note change. Brake switch sensor: Activating the break triggers a switch – currently used to modulate the tone. 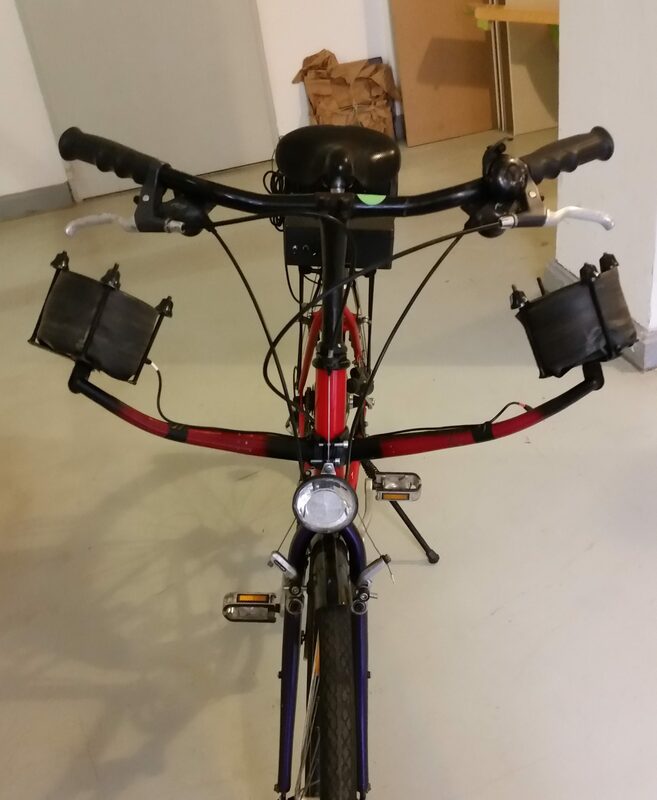 Sense hat on raspberry pi & handlebar sensor: Together they measure the tilt of the bike from lean and turn – currently used to filter the sound. 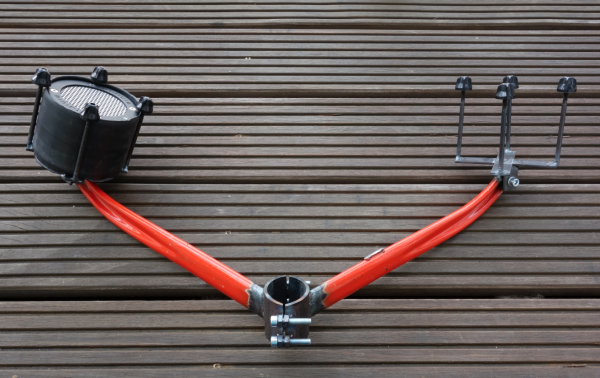 The sensory bike comes with a newly design speaker bar, made from recycled bike frames and features adjustable speaker heads – so as to position the speakers more accurately for each rider. 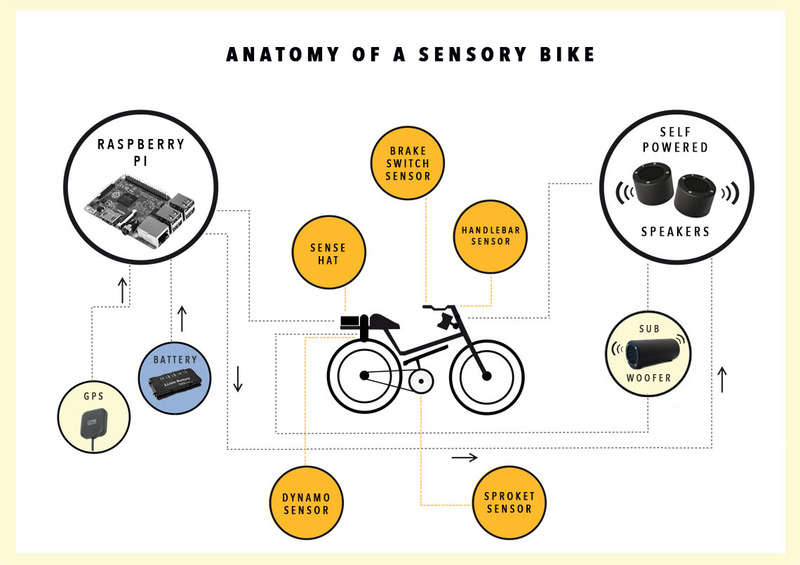 The sensory bikes performs on the same hardware at the sonic bike but with additional sensors. A full TECH SPEC is coming soon on our WIKI. The sensory bike uses the same software as the sonic bike but also uses PureData for the new data streams.